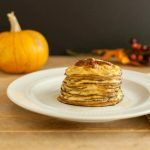 Pumpkin Cheesecake Pancakes Low Carb are sugar free, keto and gluten free. 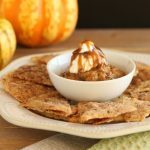 Pumpkin spice pancakes with a creamy pumpkin cheesecake spread for a lovely breakfast treat that will make your mouth happy! 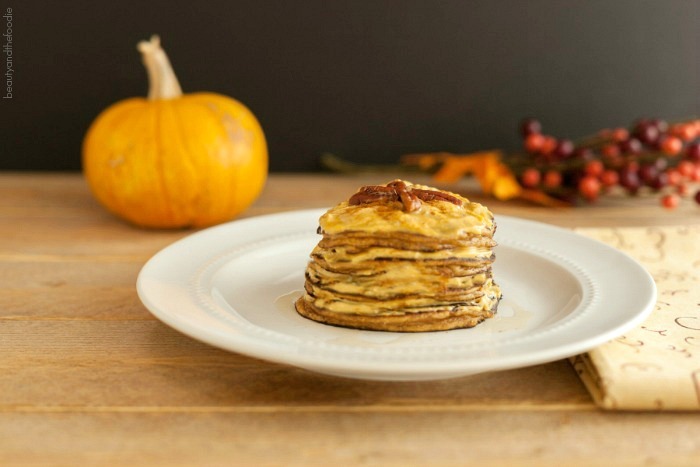 Pumpkin Cheesecake Pancakes Low Carb are a lovely treat for weekend mornings. 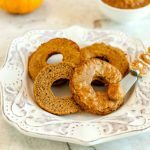 These are gluten free low carb pumpkin spice pancakes with a super yummy pumpkin spice cream cheese topping. 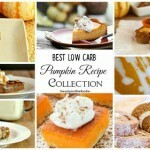 This is almost a dessert breakfast, but still sugar free and low carb. My son just loved this recipe. He gets so happy when we have any sweet type of breakfast and not eggs. He gets bored with eggs, and he is not even on the low carb diet, lol. I guess I do tend to make eggs a lot. What can I say, they are easy to make & I get tired. However this pancake pan makes life so much easier. I added some sugar free whipped heavy cream to the top on this one. Preheat griddle to 350 F (170 C). Add all the liquid pancake ingredients except for the water into a blender or processor & blend. Then add all the dry ingredients and blend until smooth. 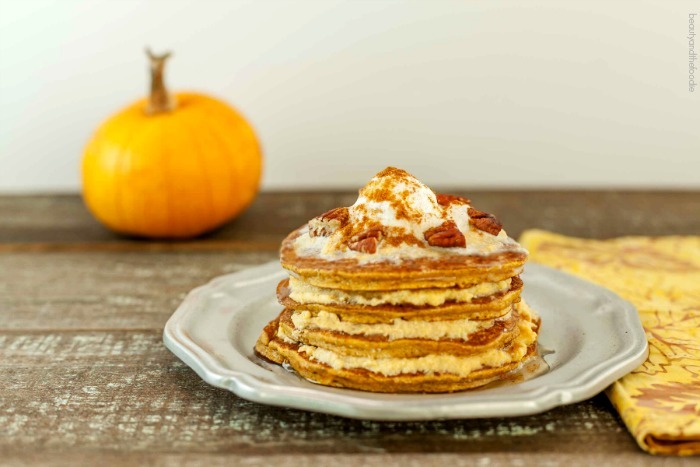 Spread each pancake with a 1/2 tbsp of pumpkin cheesecake spread and drizzle with sugar free maple syrup and garnish with chopped pecans if desired. We made these today and loved them! Thank you, Kathlena, for your kind words and for trying the recipe. So so good! I was lazy and blended everything at once in my Magic Bullet and they were AMAZING! Light and airy, I cooked a little longer (with butter) to get the edges slightly crispy then topped with berries. Mmm! Thank you!! Thank you, Lolly Jane. Blender pancakes are the way to go! I just made these for the first time and they were amazing! Definitely will be making them again. These tasted great but didn’t cook inside. I had to add a lot of water to make the batter pourable so maybe that’s why? I had to cook them forever but at least they didn’t burn easily. Kids loved them but I’m not sure if we’ll make these again. I’ll never understand why people leave comments before they have even tried the recipe. What a waste of everyone’s time.I HAVE tried the recipe and have to say it is delicious. I was worried initially about the pancakes as the batter looked very grainy and while they were cooking looked as though they would not stay together. They did.The addition of the cream cheese topping….well done. Thanks for the recipe! 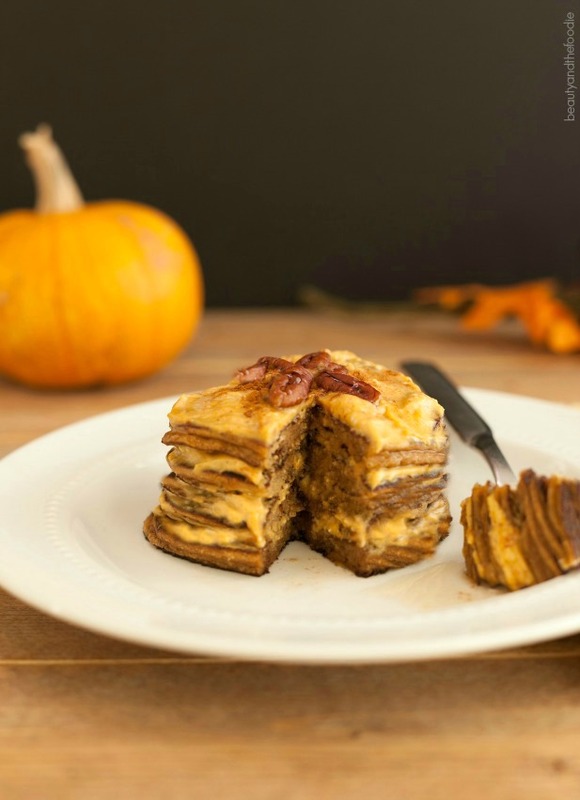 The combination of cheesecake and pancakes are really interesting! I should try this tasty recipe! It’s like dessert for breakfast – except… It IS breakfast! This would motivate even the worst “morning person” to get out of bed!! Awe Gigi, you’re the best!! 🙂 How did you know I’m the worst morning person?? 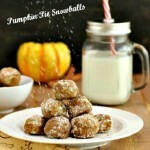 Beautiful photos and such a delicious sounding recipe! Yum! I second the idea about sweet things for breakfast! And I love pumpkin! Thanks for the delicious recipe! Thank you Sarah for your kind words. Stacey, my kids could eat eggs every day – It’s I who needs a little variation sometimes! These pancakes would certainly make me a happy woman! I love the cream cheese topping – great idea. Well at first I was a bit scared by the long ingredient list – but actually when I look through it I already have most of those items in stock! Yay! Georgina, most of the ingredients are ones I always have on hand.